Beyond Sausage: Now Available at ALL Veggie Grill Locations! It's official! Beyond Sausage is now available at ALL Veggie Grill locations. 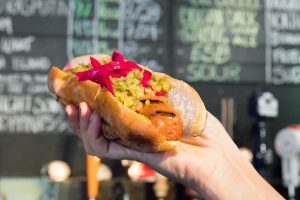 Fans can enjoy the Wunderbrat: A Beyond Sausage Original Bratwurst served on a Pretzilla bun with Sierra Nevada cheese sauce, caramelized onions, mustard, pickled red cabbage and crispy fries.